Local 100 activists turned out in force for Phase II of the union’s “New Yorkers Deserve a Rat-Free Subway” for leafleting at the 149th Street & 3rd Ave. Station in the Bronx. 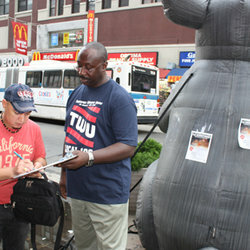 More than 700 passengers (some actually waited in line) signed the union’s petition to the MTA, which demands action to address the growing rat problem in the subways. Phase I of the campaign took place last week with a similar event at Jamaica Center Terminal in Queens. We have collected more than 1,500 signatures already. • tight-fitting lids for trash storage bins.